Speaking of History...: What Would You Tell Mr. Obama in 100 Words or Less? What Would You Tell Mr. Obama in 100 Words or Less? This blog post is a special assignment for my 8th grade American History class but anyone is free to join us. If you could tell Mr. Obama anything in 100 words or less what would it be? Would it be advice? Would it be words of wisdom? Would you tell him what you would like to see him do as President? Would you tell him which issue is most important to you? Here is his official website as he transitions to the presidency. Please leave a comment on this blog post. I am asking my students to leave their comment as "anonymous" but leave their first name at the end of the post. No last names please. Thanks. 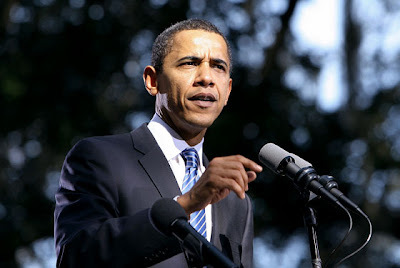 If I could tell Obama something, I would say to him that I believe he will be a great leader. If he does good things our nation will enjoy him as president. Also, just do a good job. Congratulations on becoming the first African-American President of the United States! How are you feeling about making such a historic place in history? As a citizen of these states, I would like to talk to you about which issues I think are most important right now. For starters, our economy is the worst it has been since the Great Depression. What are you going to do to help solve this horrible issue? I want to let you know that I have complete faith in you as our next president. Again, congratulations! I would tell Obama that I'm happy to have him as our president and I hope he helps our country in anyway he can and not make it worse for us and everyone who calls the United States home. To get the people of America to believe that you are a amazing president you are going to have to make some major changes. Well first off do not start out by cutting Bush's tax cuts, start out with something a little more risky, like something for our economy. Also you have to keep the promises you made in your journy to the white house, people will respect you more if you take the time to follow through with your promises. I know you will be one great president, thank you for making our county a better place. Think carefully about every decision you make-exspecially relating to the war in iraq. Think not only about the effect it will have on us, but how it will like wise have on the people on the other side. Put safety first in everyone of those decisions. What a honor it is to meet you. I am amazed and happy that you have become president. You have changed history forever. Whoever says it can not happen...well they are WRONG! And you are the one who changed that! No matter what had happened on election day, we would have made history, but you made it so that anyone, anywhere, can do anything they want as long as they try. Thank you for being the person who changed that! If i were presedent I would try to make 4 wheelers and go-carts leagle on the street.Also i would try to make a law where gas can not go over 2 dollers a gallon. If I could talk to Mr. Obama, I would express how I felt to him. I would say that I was a little disapointed with the election results. People say that your plan is to pull all of the army troops out of the war and not do anything about that. I feel that this might be a bad decsion because all of the people we were in war with might not be too happy about just letting us come out of the war. We could have a terris attack on our country. I would also tell Mrr. Obama that I don`t agree with all of the things he is for. In the past, George Bush hasn`t exactly been helpful and good at keeping promises. I hope you decide to listen to us, think real hard about the issue, and make the right decision. Also, I hope you keep all your promises and make our nation a better place to live. If I were you in office I would start thinking of ways to lower USA's debt so that we can afford more school supplies, and not have as many business, and decrease the unemployment rate, so our country has a better education. I would tell Obama that I support all of his ideas. I think that his ideas would benefit this country greatly and I would also tell him that if he wants this country to come out of this financial downfall, he shound bring the soliders in Iraq home. If I could say anything to Obama, first I would congratulate him. I would tell him that most of his campaign was run on the concept of "change" and that he needs to live up to what he promised everyone while running. I would also tell him to be careful on important issues such as Iraq, which is one of the main reasons why President Bush's approval ratings plummeted. To close, I would tell him to do his best to make our country the best place possible for it's citizens. I would tell president Obama that he needs to do a good job. Personally, I did not want him. But, the country elected him. Obama needs to keep his promises. He needs to show that even though he has VERY little experience, he can lead a country. If I could tell Obama something it would probably be congrats on being the first African American Presidentof the U.S. Also i would tell him he better be a good president because in about 100 years kids are going to be studing him like crazy because you changed history.Also if I were you i wouldn't raise taxes because there will be a lot of angry people in the states. If I could tell Obama anything than I would tell him, Congrats on winning and I was rooting for him. Also I think think he will bring change to the nation. I would warn him how hard it's going to be to try to unite the nation. That he is a great person and I can't wait until he is put into office on January 20, 2009. I think he would be a great leader because he focuses on the middle class not just the wealthy and I like his health care plan because it insures all americans are given insurance even the people who can't afford it. I also like his plan for using natural resources and alternative fuel to cut down on pollution. And Congradulations Mr. Obama on winning the presidental election. American voters WANT and NEED leaders who discuss ISSUES, not people. Thank you for running the type of campaign that I believe to be fair and impartial. I also have a hard time voting by party. I am extremely conservative about some issues, and extremely liberal about others. I always vote by issues, not by candidates. I appreciate your thinking of my views when running your campaign. Congratulations! Are u glad to be the first Aftrican American President? I am so happy you got elected. I believe he is a great leader! Just do what you told people you would do. Do good on our nation and i will enjoy him as president! Congratulations on becoming the next President of the United States of America! Although, you did not get my vote, I wish you luck with this HUGE responsibility. Before you sign any law on abortions, please think of that poor baby. The baby deserves the chance to live, just like we do! I think you should ban abortions because they are morally incorrect and very disturbing. Also, fix the economy, but don't take money from people who worked hard to get that money!Think of everyone before you pass a law. If I could talk to Obama, I'd tell him congradulations for becoming our new president and that I hope he brings freat change. If i could ask him a question I would ask how he felt during this whole election and how it was when he was giving his speech. And again, congrats! If I could ask Mr. Obama anything I would ask him if he is intimidated by the country he has to govern, with the ression and the financial crisis we find ourseves in. If I could talk to Obama about anything i would say ..
Congrats on becoming the first African American presedent. That is really cool that you get to be apart of that, it is a big deal and will always be talked about in textbooks. If I could tell Obama something it would be, great job and i'm happy that you are the first african american president and how do you feel. If I could talk to Obama I would like to ask him some questions. One question I would like to ask is are you going to bring all the troops home at ones or slowly to avoid rush and keep peace. I have very much enjoyed reading the students' comments. I would also congratulate Mr. Obama and tell him that I have confidence in his abilities to unite our nation and get us through the economic crisis.